This is a review of a split cassette between California's Allumn and Ukraine's Ancient Funeral Cult called "When Everything Was Gone" which was released by Narcoleptica Productions and we will start off the review with Allumn a 1 man project that plays a very raw and depressive form of black metal. His side of the split starts out with some clean guitars and after a few minutes grim screams are added into the music and the songs get more heavier and add in some melodies and more of a depressive black metal sound and on the following songs some of the riffs start adding in more of a raw feeling along with some vocals getting more deep and dark. Throughout the recording you can also hear a great amount of atmospheric synths at times as well as a small amount of spoken word parts, when solos and leads are utilized they are very dark, melodic and depressive sounding and towards the end clean guitars make their return on the last track, the production sound s very dark and raw while the lyrics cover dark and depressive themes. In my opinion Alumn are a very great sounding raw and depressive black metal band and if you are a fan of this musical genre, you should check out his side of the split. RECOMMENDED TRACKS INCLUDE "When Everything Was Gone" and "Ov Morrow". Next up is Ancient Funeral Cult a band that plays a raw, melodic and satanic form of black metal. Their side of the split starts off with a very fast and melodic black metal sound that also utilizes a great amount of blast beats and after awhile grim screams start becoming a huge part of all of the tracks and the songs also bring in a great mixture of slow, mid paced and fast parts and the solos and leads the band uses also remain true to a melodic musical direction and the last track is all instrumental and uses some clean playing, the production sounds very dark and raw while the lyrics cover Satan, Death and Anti Christianity themes. In my opinion Ancient Funeral Cult are a very great sounding, raw and melodic black metal band and if you are a fan of this musical genre, you should check out their side of the split. RECOMMENDED TRACKS INCLUDE "Will Burn!!!" and "Faithbreaker". 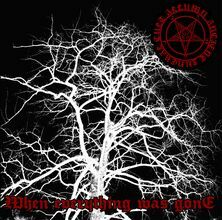 In conclusion I feel this is a very great sounding split and I would recommend it to all fans of raw, depressive, melodic and satanic black metal. 8 out of 10.